Pure Awareness of the Eternal is Bliss. "Try to adjust everywhere",if you gulp this phrase into your life,its enough.Your peace will stand up own its own.In starting you will get reactions of your past behaviors and deeds,for beginning late but automatically the harmony will start to hold its ground.If you don't try to adapt in this era,you will be concluded. You will meet various personalities in your coming days and if you have the talent of harmonizing with them,you have already achieved your hiatus.If we simply not try to adjust with opposite in life then dangerous outbreaks will continue forever and which will hurt us,both physically and mentally. Why should I let go?Why I am the one adjusting? The world is beautiful,at the same time its cruel.If you deny adjusting,it has its own rules to adjust you.From the birth to death,you got to adjust in every scenario and the type of condition doesn't matter.Cry or laugh,you ought to adjust.If you like studying or not,you have to get adjusted and study. If you like your new professor or not,you got to adjust with him and learn.Life has different paths and its one of them.Try to experience the intense feeling when you try to sync with others.It will surely improve your relations with your family,friends,colleagues,roommates etc. So,the simple spell of accommodating with others can sparkle your life in many particular ways. When you can't change the direction of wind,adjust your sail. 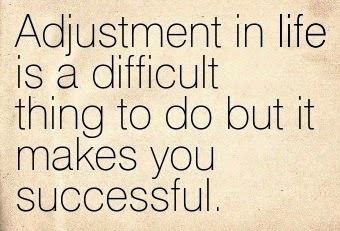 KEEP CALM AND ADJUST TO CHANGE! Copyright Pure Awareness of the Eternal is Bliss. - 2014 - . All rights reserved. Shashwat Parsana@COPYRIGHT. Awesome Inc. theme. Powered by Blogger.